We are very concerned about how other web sites use our personal information (name, e-mail address, preferences, etc.). The, owner of Bounce Hoppers is committed to your privacy. As a result, we will always make sure that any information you elect to provide us is kept confidential. We pledge that we will never provide that information to anyone else. 761 Dwyer Rd. Virginia Beach VA. Yes it is. Shopping at www.bouncehoppers.com is extremely safe. All our nline credit card transaction are place thru either PayPal and Square App. Bounce Hoppers provides live support during Business Hours to answer all your questions about party rentals, bounce houses, spacewalks, moonwalks and slides. To speak to someone about inflatable party rentals, please call 757-689-4273. We have event experts ready to answer your immediate questions about using our party rental equipment. 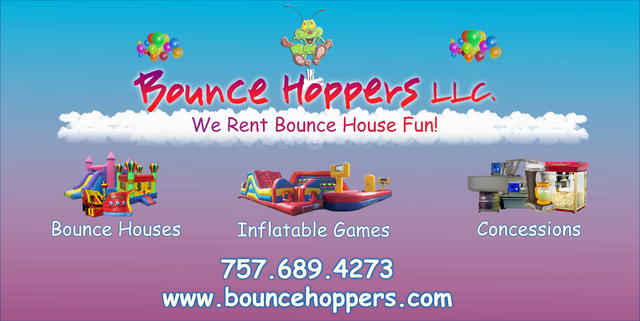 Thank you for visiting Bounce Hoppers - your source party supplies, rentals, and bounce houses and water slides.